The Cockspur coral tree is the national flower of Argentina and Uruguay, and the official city tree of Los Angeles, California (where it is referred to simply as "the coral tree") It is a small annual tree, with a trunk measuring 50 cm in girth, and usually between 5 and 8 metres high, though some grow up to 10 m. The stem is woody, irregular, and of branches with spines that form a layer without definite form and die after the flowering. The flowers, arranged in inflorescences of the raceme type, are pentameric, complete, and of bilateral symmetry. Their color is red. Its calyx (all the sepals together) is like a little thimble of red color. 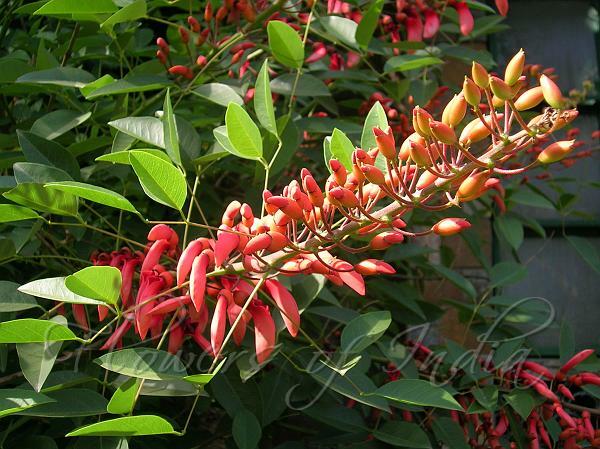 Sepals and petals are of similar color, unlike Indian Coral Tree in which the sepals are green. The petals called wings are very small; they are practically hidden within the calyx. 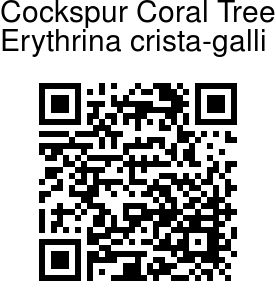 The other two petals sometimes partially weld together, and form the keel or carina, serving as protection for the organs of reproduction.